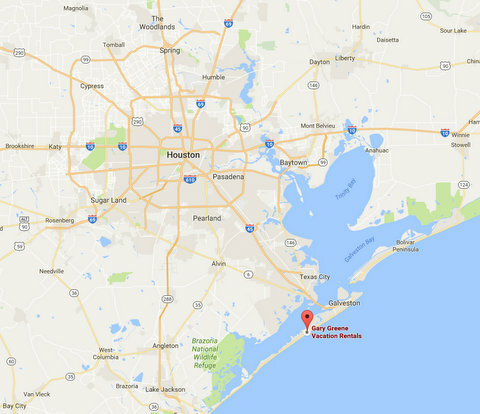 If you plan on using GPS please first try looking up our business name, Gary Greene Vacation Rentals, before entering in our address: 13450 Termini-San Luis Pass Road, Galveston, TX 77554. Take I-45 South from Houston, Texas. After crossing the Causeway Bridge, take Exit 1A to 61st Street; take a right on 61st Street until it dead ends at Seawall Boulevard. Turn Right onto Seawall Boulevard and continue to drive West approximately 7 miles; our Gary Greene Vacation Rentals office will be located on the Right side of the road. Option 1 – Take I-10 West from Beaumont, Texas. Take Exit 829 toward TX-124 Winnie/Galveston. Continue on TX-124, it will merge onto State HWY 87. Take the Bolivar-Galveston Ferry to Galveston. Continue onto Ferry Rd and it will merge to Seawall Boulevard. Continue on Seawall Boulevard for 13 miles. Our Gary Greene Vacation Rentals office will be located on the Right side of the road. Option 2 – Take I-10 West from Beaumont, Texas. Take Exit 798 towards Baytown, turn Left onto TX-146 South. Continue on TX-146 South until you reach I-45 South. After crossing the Causeway Bridge, take Exit 1A to 61st Street; take a right on 61st Street until it dead ends at Seawall Boulevard. Turn Right onto Seawall Boulevard and continue to drive West approximately 7 miles; our Gary Greene Vacation Rentals office will be located on the Right side of the road. Take State HWY 288 South from Lake Jackson. Take the TX-332 East exit toward Texas 288 Business N/Angleton/Surfside. Turn Left onto County Rd 257, there is a toll bridge before you get to San Luis Pass Rd. Continue onto San Luis Pass Rd for approximately 15 miles. Make a U-turn at 11 Mile Rd, our Gary Greene Vacation Rentals office will be located on the Right side of the road.